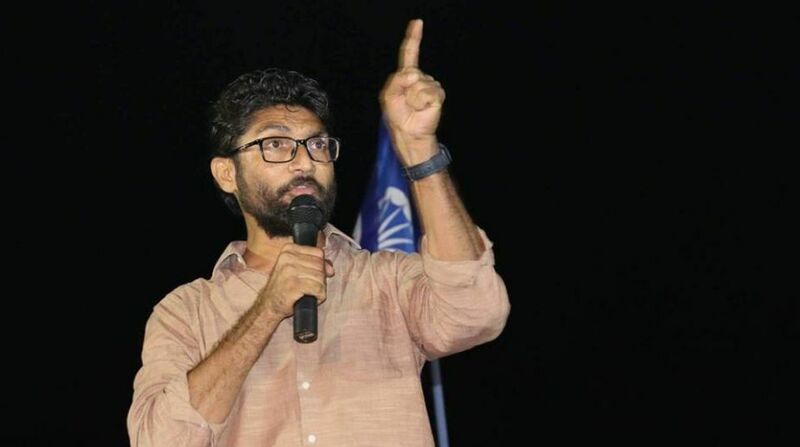 Police have booked Gujarat MLA Jignesh Mevani and JNU student leader Umar Khalid for making provocative speeches ahead of the Bhima-Koregaon clashes and denied permission to a meeting they were to address in Mumbai. The newly elected MLA and Dalit leader Mevani and the Jawaharlal Nehru University student Khalid were scheduled to be among the main speakers at the now-cancelled All India Students’ Summit 2018 under the aegis of Chhatra Bharti. Mumbai police on Thursday denied permission for the meeting. Their preventive action followed a decision late on Wednesday night by Pune police to book the two leaders for their speeches at the Bhima-Koregaon village on 31 December. They were charged under sections 117 and 153A of the Indian Penal Code for “fomenting communal disharmony through provocative speeches” at an event at the village near Pune. The FIR was lodged at Pune’s Vishrambaug Police station on a complaint by two local youths, Akshay Bikkad and Anand Dhond, who claimed they did not belong to any organisation. Sources said the Mumbai police decision to scuttle students’ meet in the city was a follow-up action prompted by the FIR filed by their Pune counterparts as more details of 31 December meet were gathered by them. According to intelligence sources, the Bhima-Koregaon conference called “Elgar Parishad” (roughly translated as ‘war cry meet’) was also attended by Naxal or pro-Naxal activists. In that battle, British forces with the participation of the Mahars inflicted a defeat on the Peshwas. The FIR cites extracts from the speeches by Mevani and Khalid in which they allegedly asked people to rise against “present day Peshwas” ~ a barb directed at the Maratha community. In next day’s violence, a 28-year-old Maratha youth was killed and 12 other people injured. The alleged call for an uprising is being cited by Pune and Mumbai police as a cause of violence not only in these two cities but across Maharashtra. Meanwhile, as Dalit anger calmed down, the Gujarat MLA tweeted, asking people to shun violence and maintain peace. He also appealed to Maharashtra government to ensure that the “rule of law” prevails.